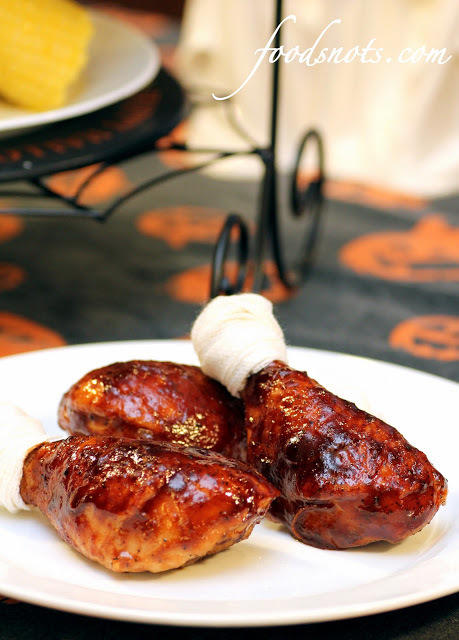 Here is a fun and quick meal for Halloween. The only thing I didn’t like was I thought that there was way too much orange zest in the sauce. It’s completely overpowering. So, if I were to make this again I would only add a little orange zest, not a whole teaspoon. Other then that this recipe was super good and my kids had so much fun with the theme. Enjoy!! Preheat oven to 375 degrees. Combine barbecue sauce, jelly, steak sauce and orange peel in small microwavable bowl. Microwave on High 1 minute or until jelly is melted. Stir until well blended. Spray broiler rack and pan with cooking spray; arrange chicken pieces on rack. Sprinkle with salt and pepper. Broil 25 to 30 minutes, or until no longer pink in center cooked through (165 degrees), turning frequently. During the last 5 minutes of broiling, baste chicken with half of the sauce. Pour remaining sauce over chicken. Let stand 5 minutes to cool slightly. Wrap bottom portion of each drumstick with strip of gauze.